The new year began in great style on the 16th January, having benefitted from a large influx of new members over the last few months of the previous year. We now have a large and balanced choir across all four parts (soprano, alto, tenor and bass) and we are a jolly, enthusiastic bunch. We meet at Liss Infants School at 7.30pm for two hours of singing a range of music from The Beetles to Queen, Mary Poppins to My Fair Lady as well as folk songs, Verdi and Vivaldi. New singers are always welcome to join us. 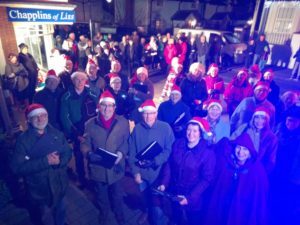 We are a community choir, which means that we have no auditions, you do not need to be able to read music and we have an enormous amount of fun singing every week. We are lead by Erika Kollek who is an experienced singer and teacher. All you need is enthusiasm and you will pick things up very quickly while enjoying group singing. If you would like to join us you can contact us at lisscommunitychoir@gmail.com or on Facebook or phone Shanagh (Shay-na) on 07765 140018, or just come along on Wednesday at 7.30pm and give it a go. During the year we sing for pleasure and primarily for our amusement. There is a summer concert to aim for and, in the past, we have raised funds for The Rosemary Foundation, the Liss Infant School, the Southern Spinal Injuries Trust and the Petersfield Counselling Service. As a thanks to Liss Infants School for letting us use their hall for our weekly rehearsals we have been able to provide funds to provide musical instruments. Rehearsals are on Wednesdays at 7:30pm at Liss Infant School.